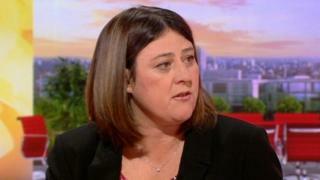 The police and crime commissioner for North Yorkshire has said she may not stand for re-election after failing to be selected as the Tory candidate. Julia Mulligan received less than half of the party vote in Tadcaster on Thursday to be automatically selected for the 2020 elections. Mrs Mulligan said she was disappointed with the outcome. She said she had always done what was "right for the public", but had "ruffled feathers". Mrs Mulligan, who is automatically entitled to be on the shortlist, said she "didn't know" whether she would stand. "There is a new process starting in May, and we will see where that gets us," she said. "It doesn't matter about me at the end of the day - I can pick myself up and move on." Mrs Mulligan, who has been police and crime commissioner (PCC) since 2012, took over North Yorkshire's fire and rescue service last year. "In this job you have to make really difficult decisions and there are things I have done which have been really unpopular," Mrs Mulligan said. "Taking on the governance of the fire service - a lot of local councillors did not like that." According to the Local Democracy Reporting Service, some suggested there would be nothing to stop another candidate from running with a pledge to remove the fire service governance from the commissioner's role. Others said Mrs Mulligan had failed to communicate with them. Some also said they did not feel the vote was representative of North Yorkshire Conservatives as only about 100 people voted - about 1% of the party's membership.